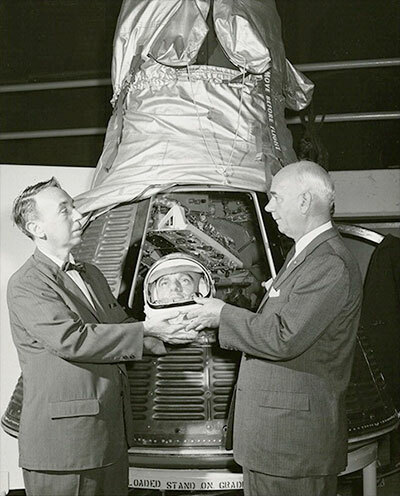 While processing a National Air and Space Museum Archives photo collection, I came across this image — two men holding the wax head of astronaut Alan Shepard! chet Is that what led to Shepard being named "head" of the Astronaut Office in 1963? Michael Davis Could that be Robert Gilruth on the right? chet One of the links Robert posted above identifies the gentleman on the right as Philip S. Hopkins, Director of the National Air Museum (in 1961). Cozmosis22 The guy on the left is giving his best Alfred Hitchcock impression. A bit unsettling and a morbid image only appropriate for Halloween. Someone had a strange sense of humor to stage that picture. Obviously, not an official NASA photograph.